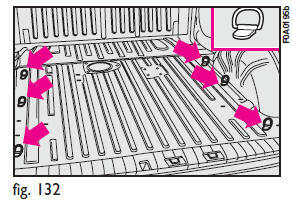 A boot mat is provided (optional for Fiat Doblò Cargo base versions). To fasten the load, fastening hooks are provided (quantity varying according to versions) fig. 132 secured to the floor and that can be accessed directly also if the mat is fitted.